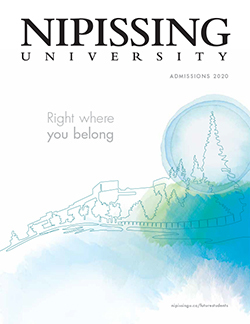 Nipissing is a young, comprehensive university with a wide variety of Arts and Science, Professional and Graduate level programs. Our focus is on student success. We believe that everyone brings a unique set of life experiences to our campus community, so whether you are pursuing an undergraduate degree directly from high school, using your college diploma to apply for advanced standing, transferring from another institution, participating in one of our partnership programs, starting a second career, or pursuing graduate studies, we’re waiting to meet you! Our on-site, online and blended learning class sizes are small and interactive. They offer the opportunity for personalized attention from accessible professors who get to know you by name and care about your progress. With access to a full range of services to assist you academically, financially, and personally, you will earn a quality and comprehensive education. If you’re ready to decide what shape your life will take, see for yourself why you belong at Nipissing University.